We have joined forces with QSuper, Official Supporter of the Queen's Baton Relay, to bring you the inspiring stories of Queensland's batonbearers. The Queen's Baton Relay is not only a time-honoured tradition for the Commonwealth Games, it's an opportunity to celebrate everyday Australians who make an extraordinary contribution to their community. Since leaving Buckingham Palace on March 13 last year, the Queen's Baton has travelled to every nation and territory in the Commonwealth as part of its journey to the Gold Coast. It arrived in Australia on Christmas Eve last year, and by the time it reaches Carrara Stadium on April 4, the Queen's Baton will have passed through 3500 pairs of very worthy hands. Meet a few of the QSuper members and proud Queenslanders who will be carrying the Queen's Baton with pride. When Michelle Wardle takes the Queen's Baton in Redcliffe, north of Brisbane, on March 30, she will be counting her blessings. 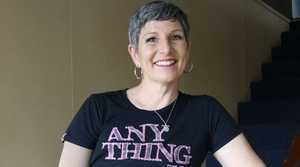 Despite suffering a series of major health setbacks in recent years including prolapse, depression and breast cancer, the 47-year-old mother of two can always find something for which to be grateful. "Four months before I was diagnosed (with breast cancer) I went and listened to Oprah Winfrey who was touring Australia," says Michelle, an avid fundraiser for the Children's Hospital Foundation. "A lot of the things she said resonated with me, in particular the importance of keeping a gratitude journal. I started doing that and when I was diagnosed that's one of the things that got me through. I wasn't sitting there thinking 'poor me', I was looking at all the positive things around me every day." Not even missing her daughter's semi-formal due to a bout of appendicitis while she was undergoing chemotherapy could bring Michelle down. "I was grateful for Facetime because physically I couldn't be there but because of technology I was able to see (my daughter) getting ready, and everything," she smiles. "When you are positive it opens up new avenues and new possibilities." One of those avenues, is the Queen's Baton Relay - for which Michelle was nominated by her mother and daughter. "I was in oncology when I got the email that I'd been accepted as a batonbearer but I wasn't allowed to tell anyone," Michelle says. "I was crying tears of happiness and the nurses were looking at me and I said 'I'm not allowed to say anything'." The 200m distance of the relay is of no concern to the superfit triathlete and Ironwoman competitor, who is also taking part in another Gold Coast 2018 Commonwealth Games' event. "The Gold Run is a symbolic event, where 6600 members of the public get to do a 5km fun-run half an hour after the Marathon starts," Michelle says. "For me it will be a total celebration of life. I'm still here and I'm very, very grateful." "I was absolutely surprised, and completely honoured," Dion says, of his batonbearer nomination. "I volunteer my time with the SES (State Emergency Service) and I love it." 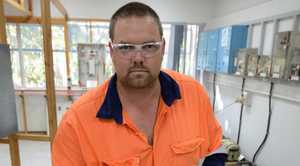 The 34-year-old electrician and QSuper member says he initially signed up with the volunteer organisation six years ago to meet new people and put his range of skills to good use. "It's one of those things - you've got to have the drive to want to do something to help others," says Dion. "It's generally when people are at their lowest, that you turn up to give them a hand." "I'm the last person you'd want to put up on a roof with a bit of damage," he laughs. "I do a lot more of their chainsaw and flood boat work and a fair bit of the training. Being in the SES is 10 per cent activation and 90 per cent training so when something does happen, you're ready to go and everyone knows what to do." What will make the Queen's Baton Relay even more special for Dion, is that when he finishes his 200m leg along Keith St in Rockhampton's South on March 23, he will be passing the Queen's Baton to his own daughter, Elaina. The 11-year-old was nominated by friends and family for her amazing efforts to raise money for the RSPCA. "She raises chickens and sells them, donating the proceeds to the RSPCA," says the proud dad. "It was all her own doing, and she does all the hard work." Dion says it's immensely satisfying to see his own community spirit shared by his daughter. "Giving back to the community is one of the best things you can do." Celebrating life is something with which Susanne Maurer is very familiar - every fortnight she helps to save three of them. 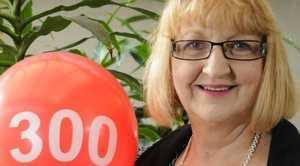 The 61-year-old Toowoomba resident is a regular blood donor, and has made more than 400 deposits with the Red Cross Blood Bank since the age of 18. Her incredible contribution to the health of others prompted her local Red Cross Blood Bank to nominate her for the Queen's Baton Relay. "Sandy at the Blood Bank asked me if I'd mind if I was nominated - and I was really, really honoured," Susanne says. "It's not something I would have ever expected to do, and I'm just so chuffed." She says giving blood is her way of giving back to the community. "I have worked in hospitals since before I started giving blood and know the importance of having blood donors. They reckon for each donation it's around about three lives you've assisted, so I like to think I've helped 1200 people." Susanne still works in hospital as an administration officer in theatre, and says it's a constant reminder of how blood donations are needed, and utilised. "It's not just whole blood, it's the various blood products which are made into so many different things." She even credits her blood donations with her excellent health - generally avoiding the colds and flu that other succumb to. "It might be that I'm constantly getting rid of blood, and generating new blood cells, " Susanne laughs. "I very rarely get sick, which means I very rarely miss giving blood." Even Susanne's involvement in the Queen's Baton Relay will not disrupt her blood-giving, with the event falling neatly between donations. On March 28, Susanne will be one of 72 people to carry the baton through Toowoomba, as it heads towards the Gold Coast for the GC2018 Opening Ceremony on April 4. The best outcome from the relay, and her role as a batonbearer, would be to encourage others to give blood, Susanne says. "I think a lot of people are worried about the needle and whether it will hurt, and how they will feel afterwards," she says. "They are so well trained at the Blood Bank, 99 per cent of the time you don't even feel the needle going in. The staff are so lovely, they're always checking on you, making sure everything feels okay." 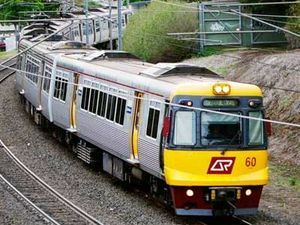 QSuper is a proud Official Supporter of the Queen's Baton Relay. Improve your financial wellbeing with QSuper's simple check-up.